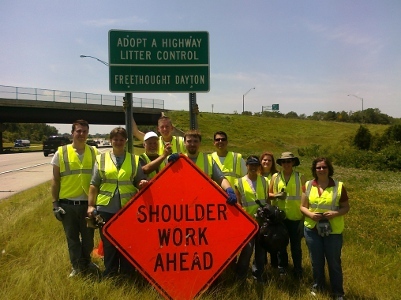 About three times a year, members of Freethought Dayton clean up a stretch of 675. This is just one way Freethought Dayton members are helping the larger community. It’s not all work… after about two hours or so of work we normally head to a nearby restaurant for lunch. No one is obligated to participate, but if you have any interest at all in helping, you will need to complete DOT training. Are you interested in helping us out? Find out more about Freethought Dayton’s community service initiatives on our meetup site.